At the end of October 1917 Sgt. Thomas Minshall, 10th (Shropshire & Cheshire Yeomanry) Bn. King's Shropshire Light Infantry, was in Cairo at the Imperial School of Instruction. 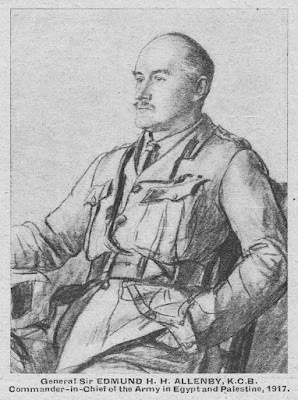 On 8 December 1917 Thomas Minshall was appointed to a commission as 2nd Lieutenant in the 15th (Suffolk Yeomanry) Bn. Suffolk Regiment. 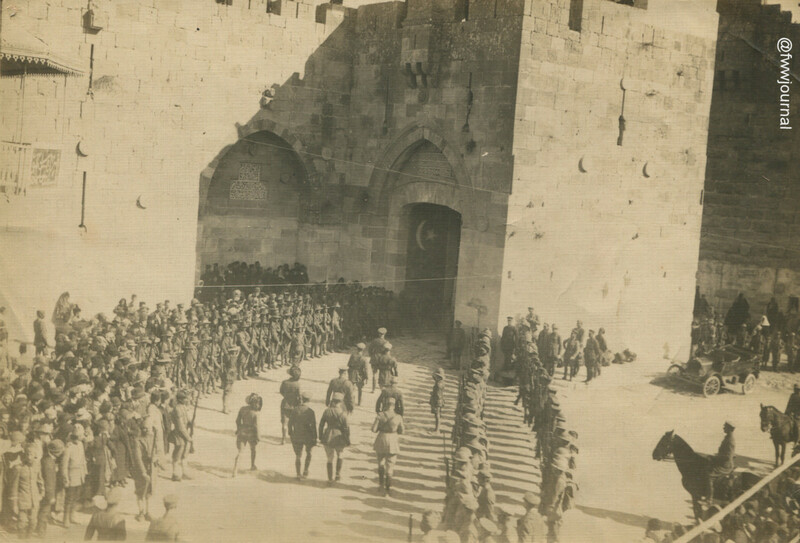 Jerusalem surrendered on 9 December 1917, and Thomas’ papers include this souvenir photograph of Sir Edmund Allenby’s entry into Jerusalem on 11 December. 9 December From Batt O.P. 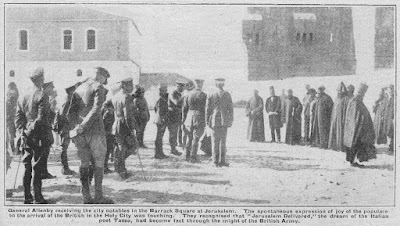 much enemy movement observed as result of attack on Jerusalem by 20th Corps. ZEITOUN and JOFFIER ridges and RAFAT were seen to be still occupied. Patrol under Sgt. Price entered EL JIB and found enemy had left about 2100 on 8th. 9-14 December Weather very fine and cold, daily patrols to EL JIB and nightly patrols to N & E. No sign of enemy outside his main position in JOFEIR Ridge which was closely observed from O.P. and was seen to be strongly held by Machine Guns in SANGARS linked up along crest of ridge. These posts were all pointed out to R.A. and noted for future reference. 8 December In accordance with 230th Brigade Order No 30 for the attack on Turkish positions S & S.W. of NEBI SAMWIL, the BN. Left Bivouac area at 0130. The First objective was some Turkish positions running N. & S. through T.18a T.18.C and T24.a. The Bn. With exception of D. Coy which followed the assaulting Bns as “moppers up” needed in support at T10.b in wadi RUWAI. The position was captured about 0800 and Bn moved up to T17 under rather heavy shell fire & thence to T17.b. 1115 Brigade after 1/2 hour artillery preparation advanced to occupy the attack on EL BURJ. The attack was hung up by very heavy enfilade machine gun fire and the Bn. Moved up to support the left (ie the Norfolks). They also came under the enfilade fire from NEBI SAMWIL. The Brigade was withdrawn slightly to a better line & held an outpost line during the night. 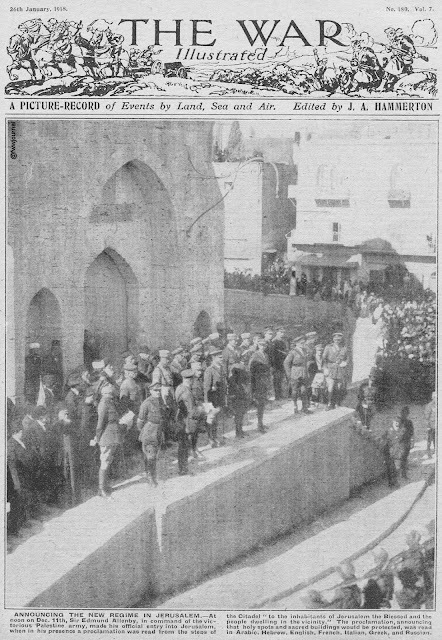 9 December The Sussex were ordered to proceed and occupy high ground N. of BEIT HANINA. Soon after arrival we had orders to return & relieve the 24th Welsh in NEBI SAMWIL arriving to heavy for and rain we missed the guides of the 24th Welsh and they were not relieved unil 0100. 0700 Orders were received to withdraw Bn, to x roads S.W. of BIDDU for work on roads. As soon as any movement was shown the enemy started shelling heavily without casualties, but the reserve Coy & H.Q. had to remain until after dark. The total casualties during these operations were 1 officer (died of wounds) and 1 (wounded) 8 ORs killed & 47 wounded. 11 & 12 December Bn. employed working on the BIDDU ENAB Rd. The War Diary for 15th (Suffolk Yeomanry) Bn. Suffolk Regiment above confirmed that they suffered casualties. Review of Commonwealth War Graves Commission records has identified the following men who appear to be the officer and eight other ranks that died. Additional family background has been researched and added. Born 1887, Hastings, Sussex. Son of Thomson and Cora Henry. Husband of May Dorothy Henry (nee Norris) of Berkhampstead, Hertfordshire. Born 1889, Gravesend, Kent. Son of Arthur and Henrietta Batcheldor. Husband of Kate H. Batcheldor (nee West), of Charlton, London. Born 1896, Ely, Cambridgeshire. Son of Edmund George and Sarah Fox. Born 1883 Hadleigh, Suffolk. Son of James and Sarah Ann Smith. Born 1896, Great Wilbraham, Cambridgeshire. Son of William and Charlotte Unwin. Born 1881, St Peters, Kent. Son of Thomas and Emma. Husband of Ethel Mary Wiles (nee Wood) of Margate, Kent. Born 1896, Newmarket, Suffolk. Son of Thomas and Harriet Lilly. Born 1894, Framsden, Suffolk. Son of Jarman William and Angelina Burrows. Geneal Sir EDMUND H.H. ALLENBY, K.C.B. Jerusalem has surrendered to the British. This great and historic event took place Sunday as the result of the brilliant operations the forces under General Sir Edmund Allenby, which, by successive steps, swept back the enemy whole line from Beersheba to Jaffa, and gradually encircling the Holy City rendered its further tenure by the Turks impossible. 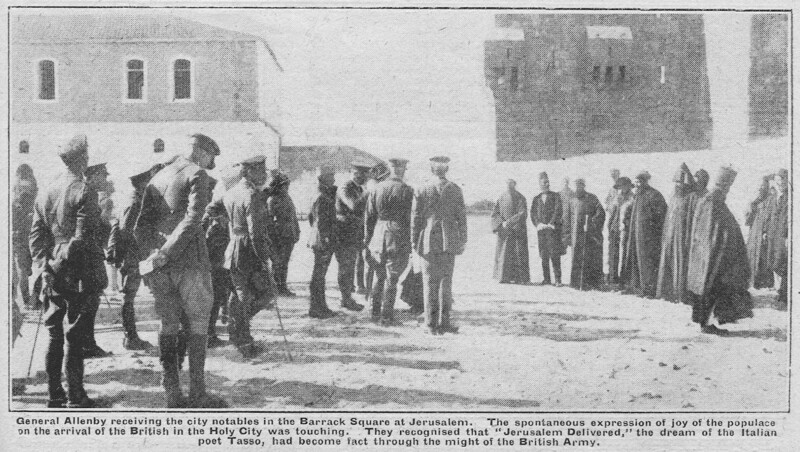 Mr. Bonar Law: General Allenby reports that on the 8th he attacked the enemy’s positions south and west of Jerusalem. Welsh and Home County troops, advancing from the direction of Bethlehem, drove back the enemy, and, passing Jerusalem on the east, established themselves on the Jerusalem Jericho road. At the same time the London infantry and Dismounted Yeomanry attacked strong enemy positions west and north west of Jerusalem, and established themselves astride the Jerusalem Shechem road. 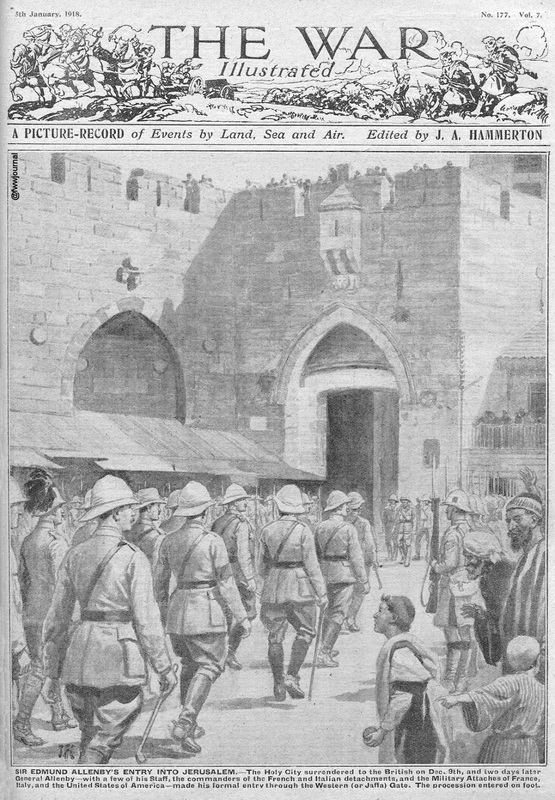 The British Political Officer, together with the British Governor of the City, accompanied British, French, Italian, and Indian Mohammedan Guards, is on his way to safeguard the city and the holy places. 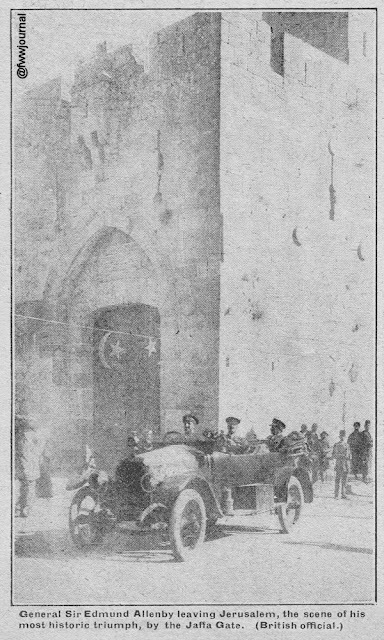 General Allenby proposes to enter the city officially Dec. 11, accompanied by the commanders of the the French and Italian contingents and the head of the French Political Mission.